We’d love your help. 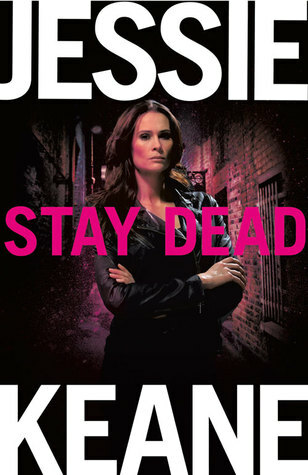 Let us know what’s wrong with this preview of Stay Dead by Jessie Keane. To ask other readers questions about Stay Dead, please sign up. What makes Annie Carter tick? And when are we going to see her daughter Layla again? jessie keane just gets better,with each book a great end to the annie carter series. Roll on for her next book can,t wait. This is the sixth book in the Annie Carter series and I sure that there are legions of this author's work who devour her books as soon as they hit the bookshelf. As this was my first book by this author and therefore my first foray into the complicated world that Annie Carter inhabits, it must be said that I struggled with the story. Not because the writing lets it down, far from it, the plot and characterisation are very good, as the author clearly knows how to target her book towards her audie This is the sixth book in the Annie Carter series and I sure that there are legions of this author's work who devour her books as soon as they hit the bookshelf. As this was my first book by this author and therefore my first foray into the complicated world that Annie Carter inhabits, it must be said that I struggled with the story. Not because the writing lets it down, far from it, the plot and characterisation are very good, as the author clearly knows how to target her book towards her audience, but for me, it was more that without the benefit of knowing the series so far, I couldn't quite grasp the hidden nuances which make up so much of the story's overall effect. Go me, another book read from my back log of books. Good old Amazon informed me I'd purchased this book in 2016, I really thought I was up to date with this series, but clearly I wasn't. It was only after I'd just read LAWLESS that I decided to check what other outstanding books I had by this author and come across this one. I've loved my little Jessie Keane binge, it's cemented again my thoughts that this lady certainly can write a page turner. Annie Carter at her best, this book I have read in Go me, another book read from my back log of books. Good old Amazon informed me I'd purchased this book in 2016, I really thought I was up to date with this series, but clearly I wasn't. It was only after I'd just read LAWLESS that I decided to check what other outstanding books I had by this author and come across this one. I've loved my little Jessie Keane binge, it's cemented again my thoughts that this lady certainly can write a page turner. Annie Carter at her best, this book I have read in just over a 24hour period, not sleeping very well certainly had it's advantages for me. Some brilliant twist and turns in this book and a lot I really didn't see coming, I love when a book can surprise me and this one certainly did that. Personally I have to say, that to fully enjoy this book then the series needs reading in order. It really will help to have the back history of a lot of the characters. When Annie Carter receives news that her friend Dolly Farrell is dead, she heads back to London. What then unfolds is a roller coaster of a ride, heart pounding, nail biting read. I was hooked from the beginning and I know we say it a lot about good books, but I really couldn't put this down. There is an awful lot packed into these pages, and it was good to read it over a short time period so my little mind didn't get lost. Some of our favourite characters from this series really show their colours here. How or where Jessie Keane gets her story idea's from I don't know, I just hope they continue for a long time to come. Thrilled to have finally caught up, and absolutely loved this book. It's a big 5 stars from me. I have really enjoyed the Annie Carter Series from the beginning. Unlike some of the female characters, Annie Carter is not one to be taken advantage of, she's strong-minded with a heart of gold. The writing style is fast-paced and the story moves smoothly throughout. If you have read the previous books in the series then you will be dying to know how the love story between Annie and Max plays out. If you haven't read the other books in the series, you're best starting at the beginning with Dirty Game which, like this book, is hard to put down, which is why I took it on holiday with me. My first Annie Carter story ... I like the main character, Annie Carter, even though I am starting on book 6 of the series. I wasn't aware that this is book 6, there were plenty of flashbacks to let the story stand alone. Annie Carter comes across as a very strong woman, with a high enough push factor, to stand her in good stead among the boys she is running with. I have read an enjoyed every book so far written in this series. I was pulled into the story right from the start and stayed there until I had read the last word on the page. This book has a lot going on but it is easy to keep up with. I highly recommend this series. I feel you do need to read them in order or you won't know what is going on. Another great book that gives us more in the lives of Annie and Max Carter. Enough detail to draw the picture of the scenes but not OTT in the gore. We say goodbye to one of the main characters from the previous books, as well as seeing where loyalties lay. A nice twist as well, which could be seen as obvious but well written and developed new and old characters. Excellent. Another great instalment in the Carter series of East End gangland stories. Revisiting old characters and resolving some unfinished stories from previous books. Recommend Jessie Keane books to everyone! Usual page-turner by this author, a few twists and turns to keep you interested. I love Annie Carter and this finishes up loose ends on her marriage to Italian Mafia boss and his death. Shocking death at start of a loveable character but vengeance is sweet. Love the Annie Carter books. They are fast moving & a good read.Similar to Martina Cole novels. Yet again Jessie Keane has not disappointed. I am not suprised to have enjoyed the latest in the the life and times of Annie Carter and co. Would recommend this to anyone who likes a bit of crime drama. I'm glad we got to know a bit more about dolly's past and what happened. I loved this book, I couldn't put it down. Brilliant read, have loved reading the Annie Carter Series of books, this one was just as good as the others.....hopefully another one soon . Absolutely loved this, I can't get enough of Max and Annie. Really enjoyed this book. Great to be back with the old characters,especially annie and max. Just brilliant, easy to read, full of action, another great novel from Jessie, don't expect anything less. Love Annie and max, lived with them for years, can't wait for the next , but not sure where it can go now unless it's all about Layla ? Loved it as I have all of Jessie keanes books. Annie is always in trouble and she's always making mistakes but she's a heart of gold and is very feisty. I loved the twists and turns and the fact that we were kept guessing as to who was behind poor dollies demise. I loved the Annie Carter books the story line was fast paced and kept you constantly intrigued. A real page turner . I just wish there were more .